President Trump and first lady Melania Trump met privately Tuesday evening with former President George W. Bush and former first lady Laura Bush on the eve of funeral services for former President George H.W. Bush. 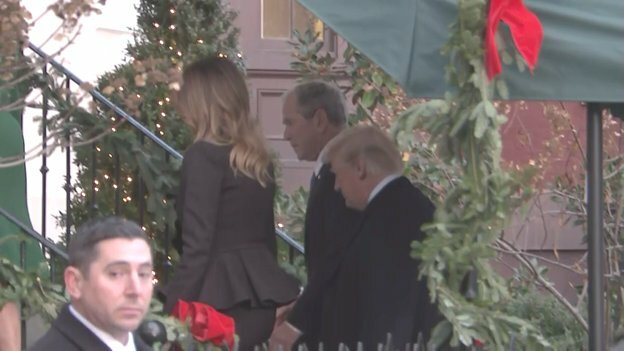 The president and first lady traveled via motorcade across the street from the White House to the Blair House, which is used to accommodate guests of honor. They appeared to warmly exchange pleasantries with George W. and Laura Bush before the four entered the building without taking questions. Melania Trump earlier in the day hosted a tour of the White House Christmas decorations for Laura Bush and other members of the Bush family who are in town for services for George H.W. Bush. The 41st president died on Friday at his home in Houston. He was 94. Thousands have flocked to the Capitol to pay respects to Bush, whose remains are lying in state there through Wednesday morning. Trump and his wife visited the Capitol on Monday night. Trump has declared Wednesday a national day of mourning, and a funeral service will be held for Bush at the National Cathedral. The Trumps, the Bushes, Barack and Michelle Obama, Bill and Hillary Clinton and Jimmy and Rosalynn Carter are all expected to attend the service on Wednesday. Trump has avoided controversy in the aftermath of George H.W. Bush's death, despite previously targeting the Bush family for criticism. He has slammed George W. Bush for making the "worst single mistake" in U.S. history by invading Iraq, mocked his brother former Florida Gov. Jeb Bush repeatedly while on the campaign trail in 2016, and poked fun at George H.W. Bush earlier this year over his use of the phrase "thousand points of light." Trump did not attend the funeral earlier this year for former first lady Barbara Bush, but George H.W. Bush reportedly made clear he wanted the current president to attend his funeral services. Trump and the first lady exited about 20 minutes later and returned to the White House. .. I need to follow up: Even the Hill is going to go down this road ? Not “Despite what George Bush said about Trump” but they are going the other way about his responses to the Bush family ? Trump’s dipping his toe into the President’s Club click which he will join in a few years. However the pool is filled with sharks wearing forced smiles. If they met privately, why are we seeing photos? Because that photo was before they met privately. What is W looking at ? US potuses have a place they go to hang out. If President Trump ever dumps Melanie Im going after her....bigly. You noticed that too, lol. Is that not ridiculous? As though the occasion of a funeral should be no different than political battles. In this country we honor passing Presidents for the office that they have held regardless of our political posture. President Bush Sr. asked that Pres. Trump and Flotus be there for his funeral. Obviously Pres. Bush Jr. and Pres. Trump have done the right thing here for his father’s request and the nation. Don’t get hung up on the small stuff...they both are leading by example in this. Yeah, and unfortunately when he does he gets deluded into thinking they will somehow accept him, rather than work to impeach him, if only he plays nice enough with them. Pictures (or video) or it never happened. And these are pictures of the public meeting. No pics from inside Blair House.